Porcelain is a ceramic material which has specific properties – such as hardness, heat resistance, translucency and toughness – that makes it very suitable for tableware and jewelry. In jewelry, the porcelain pieces were/are painted and glazed and set in brooches, earrings and necklaces. Wedgwood made porcelain items which were unglazed (biscuit). Porcelain served as a popular “canvas” for miniature portrait painting in the 19th century. 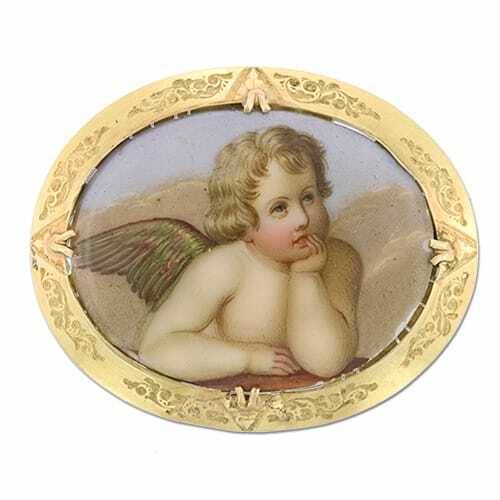 Victorian Brooch depicting a Cherub Painted on Porcelain.